Nancy Turnbull’s New Year’s Eve post at WBUR’s CommonHealth identified growth rate targets for low-cost health insurance plans that have been put out there by the Massachusetts agencies responsible for health care reform, and looked at a recent three-year period’s experience in the growth of local insurers’ medical expenses and administrative expenses. The premium growth rate targets have been pegged by different groups at 5%, 7% and nominal GDP growth (i.e., GDP growth, not adjusted for inflation). And, guess what, growth in expenses has outstripped all of these measures. Her piece unleashed a torrent of commentary from the payors (including comments from two CEOs, a CFO and the local health plan association chief) pointing out that (a) administrative cost increases of nearly 50% over three years were due in part to accounting rule changes at the Massachusetts Division of Insurance and (b) administrative costs account for only about 10% of total costs, so we’d better focus on controlling medical costs. Check out the comments on the post linked to above, and also posts here and here at Health Care For All’s A Healthy Blog. While the dialogue may not result directly in reduction of any category of expense, it is yet another step — and I must say, a refreshingly public step — towards addressing this issue in a transparent manner. Score one for the blogosphere. U.S. health care spending growth accelerated slightly in 2006, increasing 6.7 percent compared to 6.5 percent in 2005. Total health expenditures reached $2.1 trillion, which translates to $7,026 per person or 16 percent of the nation’s Gross Domestic Product. The health spending share of GDP remained relatively stable in 2006, up by only 0.1 percentage point from 2005. 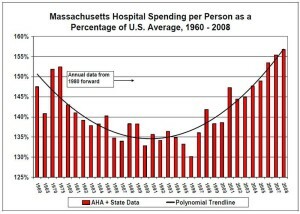 Not necessarily apples-to-apples, but it’s worth noting that the medical expense growth in Massachusetts is about 10% per year.